Naval Base San Diego (NBSD) is the principal homeport of the Pacific Fleet, consisting of 60 Navy ships, 2 Coast Guard cutters and home base to 150 commands. Naval Base San Diego consists of the wet side, on the bay side of Harbor Drive with the Main Gate at 32nd St. There are also gates at 8th St. in National City and the farthest South gate at Pier 13. All ships at Naval Base San Diego are moored on the wet side. The wet side has the Naval Base San Diego Movie Theater, Budweiser Brew House, Mini-NEX and Uniform Store, and several restaurants. 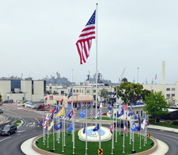 The Naval Base San Diego dry side main gate is off of 28th St., with another entrance from 32nd St. It has two gas stations/autoports, the Commissary, Main Exchange (NEX), and much more. Most Naval Base San Diego Housing is also located on the dry side. Auto Parts - 32nd St.